A couple of years ago, a friend showed me a video game cinematic for Star Wars: The Old Republic (a game I still have yet to play). Somehow, this unlocked an urge for new Star Wars material that I hadn't felt in a very long time. Unfortunately, the books and comics all felt too densely weighted down in expanded universe mythology. That left me with the animated series on Cartoon Network, which I'd heard some old school Star Wars fans deride as being shallow and completely disrespectful of established canon. "I got yer 'Coruscant Nights' right here!" But I had relapsed back into full blown Star Wars fandom and needed a fix. So one fateful afternoon, I decided to give Star Wars: The Clone Wars a try...and I was instantly hooked. Sure, the show occasionally messed up with regards established continuity (of which I have now become a fierce defender). But it usually still worked very well within the framework of the stories that came before it...and always told fantastic new tales in the Star Wars universe. The show also got better year after year (both in production quality and depth) to the point that by the end of the fifth season, viewing a few episodes back-to-back was a far superior experience to watching nearly any other current sci-fi movies or television. For me, the series ended up working as a gateway to other Star Wars related drugs: Comics, books, action figures (don't judge me), etc. I had become fully swept up into massive ocean of Star Wars synergy...and I'm still loving every minute of it (except for Hasbro's seeming inability to get new products on store shelves). So when it was recently announced that Star Wars: The Clone Wars had been canceled, a huge and predictable outcry went up to save it. But at some point, we as fans have to know when it's time to finally move on. In addition to Disney wanting to focus on the era surrounding the upcoming new films, one also has to take into account that the Clone Wars was a three year conflict. Between the stories in the comics, the books, and the television series, additional seasons would eventually mean that the characters would have run out of time during which they would have been able to eat or relieve themselves. "How do I tell Obi-Wan that my pants have finally crossed over to the dark side..."
But that doesn't mean it isn't hard to say goodbye to such a great part of the Star Wars tapestry. In honor of five season of excellent Star Wars television, RamblingBeachCat.com presents the top ten best episodes of Star Wars: The Clone Wars. Please feel free to disagree with the order or placement for any of the entries...but please also be aware of the fact that you will be wrong. A shout out also needs to be given to the Star Wars wiki, Wookieepedia, for much of the behind the scenes information and high resolution screen shots. If you are a Star Wars fan and don't have this page bookmarked yet, you're doing it wrong (although I would be embarrassed to admit the number of hours I have spent on that site clicking down the rabbit hole of massive Star Wars information it supplies). Let's start things off with the introduction of everyone's favorite Duros bounty hunter who has an affinity for cowboy hats. (Oh yeah, and THERE WILL BE SPOILERS, so read at your own peril). 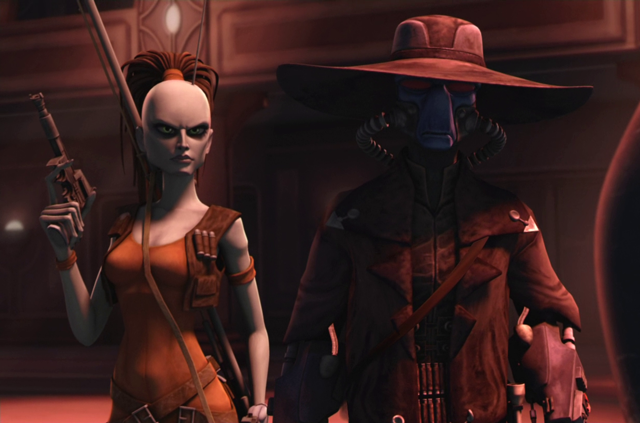 A group of bounty hunters led by Cad Bane and Aurra Sing execute a daring plan to free crime lord Ziro the Hutt from his prison in Coruscant...which begins with them taking a large group of galactic senators hostage inside of their own building. Meanwhile, Anakin Skywalker gives up his lightsaber to Padmé Amidala's in a romantic gesture meant to prove just how much he trusts her. Unfortunately, she (and his lightsaber) end up being part of the group that is taken hostage. Anakin must now find a way to rescue his wife and the rest of the senators while Chancellor Palpatine attempts to stop the bounty hunters from freeing his prisoner. With a voice like a boot walking over gravel and looking like something out of a western nightmare, 'Hostage Crisis' introduces viewers to Cade Bane in about the best way possible. He and his team (which includes the already well establish and awesome Aurra Sing) break into the Senate Building in broad daylight while easily dispatching a group of Senate Commandos. After snapping one of the guard's necks, Bane effortlessly executes his plan to get inside and take a group of high ranking officials hostage to use as a bargaining chip with which to obtain his target. And even when Anakin presents an unexpected problem with his plan, he never once loses his cool...or his hat. Speaking of Anakin, we get to see him and Padmé actually have a rare nice moment together...and once again Anakin's heart causes him to make a stupid and ill-timed decision by putting his lightsaber in someone else's hands. But the focus of this story is Cad Bane and his giant blue cajones. In just one introductory episode he shows himself to be a cutthroat and highly skilled assassin that operates at the highest level of efficiency. We also get a chance to see Ziro the Hutt again, which is always a treat (in small doses). Robonino (the tech expert who looks like a fish) carries around a backpack with him at all times. A phrase is inscribed on it in Aurebesh which translated means "PATSFAN-01." A group of new clone cadets are assigned to a remote yet vital listening outpost. As the new troops complain of boredom (and get on each other's nerves), a surprise Separatist attack forces them to depend on their training and their fellow squad members when they become the last line of defense between General Grievous and a crushing Republic defeat. 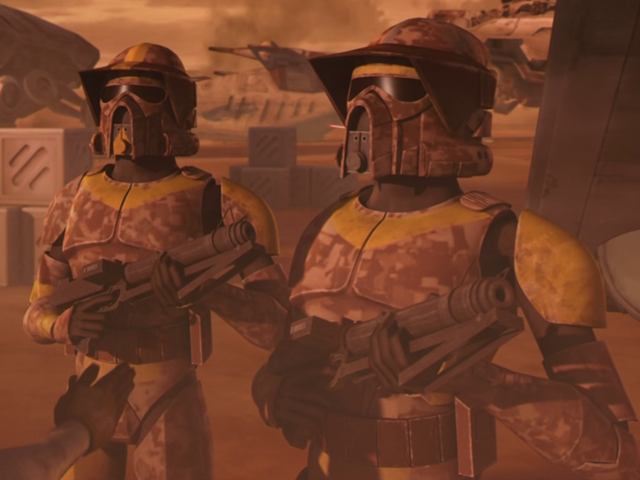 If all you ever knew about the Clone Army was based on what you saw in Episodes II and III, then you probably see them as nothing more than mindless killing machines that blindly follow orders and protocol; basically a flesh and blood version of the droid army. This episode, however, shows that the clones have distinct personalities, an ability to improvise, and a willingness to sacrifice themselves not just for the Republic, but for each other, as well. 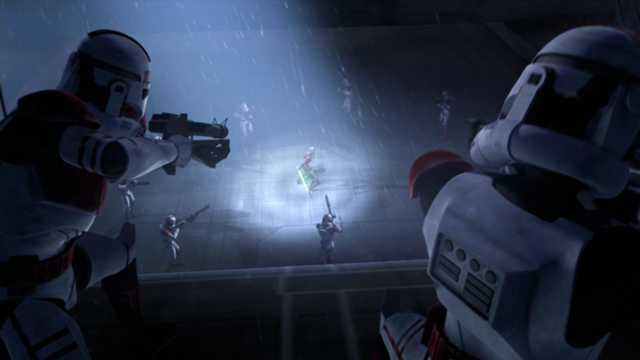 When Rex and Cody show up, we are also able to observe that battle experience and years away from home (or in this case, Kamino) give the clones an air of authority and an edge that the "shinies" have not quite attained. ...and much cooler looking armor. 'Rookies' had a lot of other nice touches to it (like the Bettie-Bot VJ playing the music and giving shout outs for a troop-centric wartime radio station and the troops giving each other nicknames) that really brought home the human aspect of the war for these artificially created men. 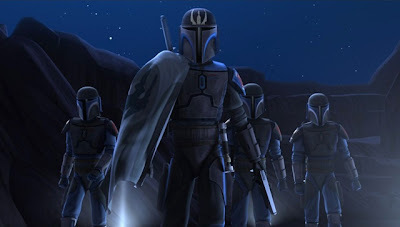 Add in a lot of great battles with a dash of comic relief, and not only do you have one of the best episodes of Star Wars: The Clone Wars, but a great primer for anyone who wants to see what the troops are like under the armor. When the episode was originally broadcast on October 24, 2008, the word "Hell" was used two times as an expletive. Both instances of the word were removed due to parent complaints, but have since been reinstated to some degree on various rebroadcasts. After getting broken out of prison by Cade Bane, Ziro the Hutt finds himself delivered to the heads of the five Hutt families...who then imprison him themselves while demanding that he turn over a journal (of which only Ziro knows the location) detailing the Hutt's highly criminal activities. With the help of his on again-off again lover, Sny Snootles, Ziro is able to make a daring escape from his new prison cell. 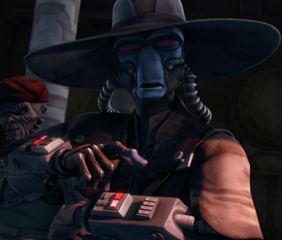 This causes the Hutts to once again call on the services of Cad Bane to track him down. Unfortunately for the bounty hunter, Jedis Obi-Wan Kenobi and Quinlan Vos are looking for his target, as well. Aside from the fact that he's dangerously close to being classified as a walking offensive stereotype, Ziro the Hutt can tend to grate on your nerves if he's on screen for too long. In this episode, however, we get to see him as more than just comic relief; he's cut throat, a bit of a sociopath, and even a little daring when push comes to shove. Meanwhile, we get some great interaction from Cade Bane and his robot helper, Todo (voiced by Seth Green). On the other side of the chase, Obi-Wan and Quinlan Vos provide a great odd couple pairing with regards to how both Jedi conduct their business. When the path of Vos/Kenobi finally collides with Bane's, an epic fight ensues in which the bounty hunter is able to hold his own against (and nearly defeat) the two Jedi with some nifty weaponry and abilities. And while I wasn't a fan of how dismissive Kenobi was of Vos (which doesn't really line up with how they treat each other in the comics), it was very cool to see the character come to life on screen and even get to use his pyschometric abilities to help with the investigation. It was also nice to see Vos look like he was having a little fun, for once (since in the comics he seems to be in a constant state of physical and mental anguish). The real kicker, however, is when Snootles reveals that she's been playing Ziro the entire time and flippantly murders him. In addition to being a complete shock (that was well set up and executed), her turn near the end of the episode shows just how treacherous the criminal underworld in the Star Wars universe can be. It also gave a nice added layer to Jabba the Hutt's already solid reputation as the the most cunning and ruthless hutt there is. It's all such an unexpected turn of events that it overshadows the other startling revelation that Ziro is actually into chicks. I can't be the only one who was surprised to find that out, right? Republic forces carry out a strike against the Separatist-controlled planet of Umbara so they can lay claim to a vital supply route. Unfortunately for the Jedi and the clones they are commanding, the local inhabitants have a strong militia that has allied itself with Count Dooku's forces. Further complicating matters is the fact that the planet itself is in a constant state of darkness, making visibility a severe issue on the battlefield. After the Republic Forces land and deploy, Anakin's squadron seems to be making decent progress until he receives a message from the Supreme Chancellor to return to Coruscant immediately. Anakin reluctantly turns command of his troops over to Jedi General Pong Krell, who instantly takes an abrasive and confrontational stance with Captain Rex and the rest of the battalion. The animation and camera work for the opening battle sequence is top notch. From the turbulent drop ship entry point to the brutal ground troop deployment, this is one of the most visceral and awe-inspiring battles you will ever seen in the series. The episode doesn't just get high marks for having a lot great battle scenes, though. 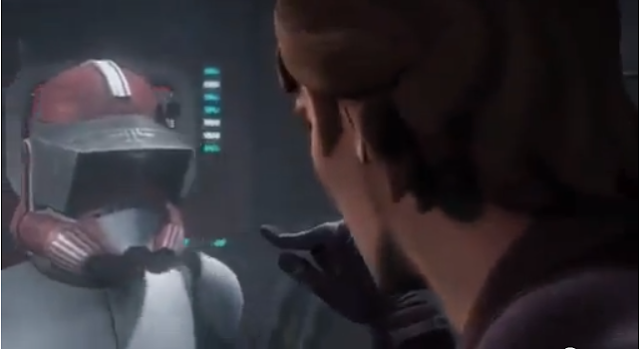 The arrival of Pong Krell and his subsequent flippant attitude towards the clones (along with his unabashed disregard for their lives) is completely opposite of Anakin's willingness to listen to suggestions from the clone officers and the concern he shows for his troops' well being. By the end of this arc (which ends up dragging on a little too long), Krell represents a strong argument for why the clone troopers were so willing to execute the Jedi generals that they had loyally served under once Order 66 was given. There are two more episodes used to establish just how heartless (and evil) that Krell is before he finally reveals his true intentions, but that had already done about as well as you could ask for in this one. Also adding to the brutality of 'Darkness on Umbara' is the fact that the clone's main enemies are humanoids. When the Grand Army of the Republic is shooting and killing creatures (or droids) that don't look like anything we would ever encounter in real life, it's very easy to accept the death that is occurring on screen. Seeing them kill actual people, however, makes the war they are fighting feel a lot more real. But despite the dark atmosphere surrounding the story (pun intended), clone trooper Hardcase (pictured at the beginning of this entry) offers some much needed comic relief to go along with his impressive battlefield badassery. When Pong Krell addresses Rex and Fives by their clone IDs rather than their nickname, he actually gets it wrong with both of them. Yes, it's a nitpicky, thing. But Krell's a huge jerk who shouldn't be cut any slack whatsoever. An intercepted communication between Asajj Ventress and General Grievous reveals their plan to attack the cloning factories on Kamino. Jedi generals Anakin Skywalker, Obi-Wan Kenobi, and Shaak-Ti lead the remaining members of the Domino Squad, along with a large defensive battalion, in an effort to protect the place that the clones consider their home. 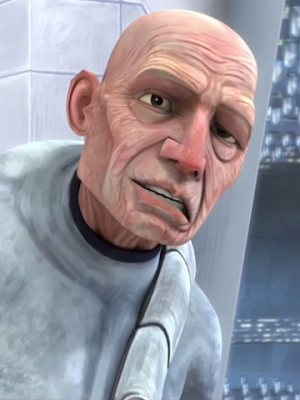 Rex makes it abundantly clear to the Jedi in his pre-battle speech that for him and the rest of the troops, the defense of Kamino is something deeply personal. It's also vital for the Republic war machine, which depends on the continued creation of clones for their army. Grievous and Ventress prove to have taken the task as seriously as the protagonists, beginning with a brilliant scheme in which debris from the opening space battle ends up housing droid assault ships (and reinforcements) that are assembled underwater. From there, it's an all out brawl to defend Tipoca City. Obi-Wan and Grievous spar in a ridiculously cool lightsaber battle while the clones hold off a massive offensive. Meanwhile, Ventress is at her deadly and seductive best, playfully taunting Grievous while kissing the lips of a Clone Commander Colt as she impales him with her lightsaber. The battle between her and Anakin is much more acrobatic and quick than the brutal slug-fest going on between Obi-Wan and Grievous, but both are wildly entertaining. We also get to see a reappearance of 99, who ends up finally getting to be a part of the battle and dies a soldier's death while serving alongside his brothers in arms. Additionally, the moment when Anakin says that he will allow the troops to execute Ventress was a great reminder that even though he may be a good guy in this series, the darkness that will eventually turn him against the Jedi still resides within his heart. The scene where Asajj Ventress impales Commander Colt while giving him a kiss was edited out of future showings of the episode on Cartoon Network. It still remains, however, on the DVD and Blue-Ray releases. After being betrayed twice by members of the Sith, Asajj Ventress returns home to Dathomir and decides to fully reintegrate herself back into the Nightsisters. Meanwhile, Count Dooku is still angry about the witches' attempt on his life (although he totally brought it on himself). He sends General Grievous and a droid battalion down to their planet with the intent of wiping them out for good. The episode's title, 'Massacre', ends up being quite apt since that is exactly what happens. This story does not feature any "good guys," but instead shows two forces of evil slaughtering each other over a conflict that began with a single paranoid thought from the mind of Darth Sidious. Unfortunately for the Nightsisters, the bloodshed is predominantly felt on their end since the army they are battling consists of droids. But the inhabitants of Dathomir put up a hell of a fight, which includes an excruciatingly painful voodoo hex on Count Dooku and the raising of a ghoulish army of undead soldiers. 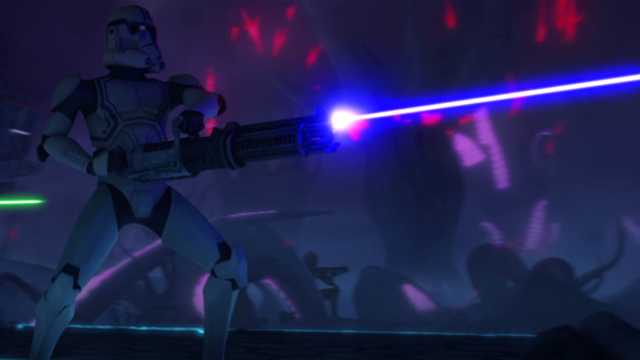 The gorgeously choreographed lightsaber fight between Ventress and Grievous is closely rivaled by the dizzying array of blaster and cannon fire that fills the night sky. We also get a chance to see Mother Talzin do more than just scheme and cast spells as she steps onto the battlefield and wreaks havoc on the invading forces. But in the end, Grievous' forces prove to be far too ruthless and powerful to be defeated. Even the normally comedic (and annoying) battle droids say their typical "roger roger" response with an air of menace as they mercilessly cut down the witches and raze their home world. "In the spirit of the strength of her character, I wanted to establish Mother Talzin's power in a menacing, yet subtle way. In order to preserve Barbara Goodson's incredible performance, I doubled her vocal track, one will be played 'raw' or unprocessed, the other will be our process track. The processed vocal track sits well underneath of the raw track, providing more of a 'shadow' of otherworldliness. This shadow voice was accomplished by pitching down her process track, sending a portion of it to the LFE (or the ".1" of your 5.1 systems), then reverb/echoing it to taste. I will occasionally bring the shadow voice more to the forefront for punctuation of certain lines or scenes." With the Republic Army stretched thin, planets that had been claimed from the Separatists and were thought to be secure have begun rising up once again. The one of most concern, however, is Geonosis, where the Clone Wars started back in Episode II. Poggle the Lesser has restarted up the Geonosian war machine, forcing the Republic to launch a counter strike to take back the planet before an insurmountable quantity of droids, tanks, and weaponry for Dooku's army can roll off the assembly line. While all five episodes of this arc are great (even the at times lame first part), Landing at Point Rain provides military action on a scale that most war movies could never hope to attain. From the shaky zoom shots of the battle cam to the sweeping wide angles of the Geonosian landscape, the entire engagement is shot so incredibly well that it feels as though you're watching a feature film. There are also multiple war scenarios happening that each provide a unique and thrilling experience. There's also a special operations aspect as Anakin, Asohka, and Rex undertake a mission to detonate a key defensive wall that is preventing their forces from penetrating the Geonosian's main stronghold. It's also worth mentioning that by this point in the series, a lot of viewers (myself included) were not very fond of Asohka Tano at all. In this episode, however, she proves herself to be more than capable in battle (unlike some of her previous attempts) and begins to finally to win us over. There's also a nice bit of comic relief at the end as Obi-Wan explains to Ki-Adi-Mundi what an elusive prize Anakin's respect truly is. 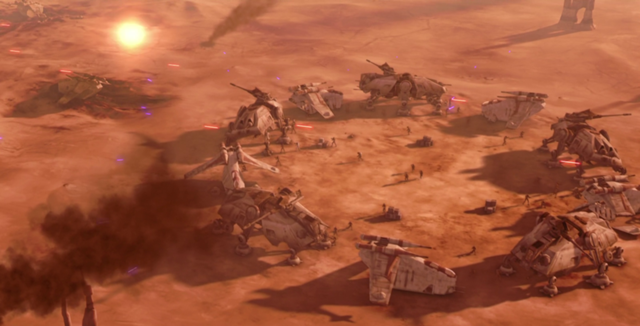 George Lucas told show supervisor Dave Filoni that he invisioned this episode as a "D-Day invasion of Geonosis." To draw inspiration (and references), the production team watched live action war movies like 'Black Hawk Down' and 'Saving Private Ryan' to get the feel of the camera work and the intensity of the battle right. A reborn (and even more powerful) Darth Maul and his brother, Savage Opress, have taken over Death Watch (after Maul executed Pre Vizsla) and installed Almec as their puppet leader of Mandalore. They have also kidnapped Duchess Satine, who Maul allows to break free long enough to get a message out to the Jedi Temple and Obi-Wan Kenobi to come help her. Unfortunately, due to Mandalore's status as a neutral planet, nothing can be done until a decision is reached while wading through the bureaucratic morass of the Senate. Unable to wait for that happen, Obi-Wan leaves on his own (just as Maul knew he would) to save Satine...and gets some unexpected assistance from a splinter group of Death Watch that refused to align themselves with the Dathomirian brothers. Meanwhile, Darth Sidious/Chancellor Palpatine decides that it is time to deal with his former apprentice personally. Usually when a villain holds off on killing the protagonist, it's a contrived plot device used to keep the story going. But when Darth Maul runs Satine through with his blade and forces Obi-Wan to sit and ruminate on his grief, it truly is an act of pure revenge. It's also heart breaking to see the usually stoic and clear-headed Kenobi break down as he and the woman he cared for so deeply (in spite of his efforts to refrain from attachments in accordance with the Jedi code) confesses her love for him while dying in his arms. 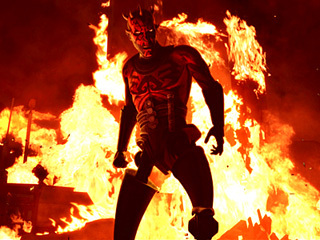 The death of a character that had been part of the series for so long (and who was so important to Obi-Wan) was both shocking and resonated perfectly with how a reborn and revenge-minded Darth Maul would want to exact revenge upon the man who cut him down so many years ago. Unlike many other shows that use characters deaths as a cheap way to shock the audience (which even the Clone Wars does itself sometimes), it was the perfect time and situation for this to happen. 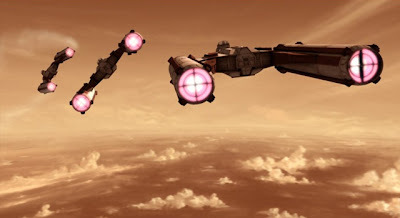 Additionally, the aerial battles between Maul's Death Watch forces and the splinter group lead by Bo-Katan (who we also learn is Satin's sister) are spectacular. But even they pale in comparison to the climatic battle between Darth Sidious and Darth Maul/Savage Opress. In addition to the fight being impeccably choreographed, the end result is a fitting downfall for Opress (who never quite measured up to his older brother) and a chilling reminder of just how powerful the Lord of the Sith truly is. -In a round table discussion with the rest of the cast about the episode, show supervisor David Filoni points out that the reason Darth Sidious has two lightsabers stems from how he used them in Episode III: The first was knocked from his hand and out of his chamber window by Mace Windu, while the second was used in his battle with Yoda. Dave, I generally LOVE the work you do, but I gotta ask something: Where was that type of attention to detail when you had Adi Gallia, a character who had already died (in a major, in-canon story from the Star Wars comics) get killed again in the first episode of season 5? -This episode was dedicated to Ian Abercrombie, the voice of Darth Sidious/Chancellor Palpatine, who died one year before it aired. After finding his brother mentally and physically broken, Savage Opress takes Darth Maul back to their home planet of Dathomir to see Mother Talzin. She is able to give him new legs made from the battle droid remains of the battle seen in Massacre and repair his mind, as well. Once Maul is awake, aware, and back on his own two feet for the first time in over a decade, he has only one desire: To get revenge on Obi-Wan Kenobi. The two brothers then travel to the planet of Rydonia and slaughter a village full of innocent families to bring their target to them. ...which it may very well have been. But Maul's "resurrection" (he'd actually been alive all these years) was executed so well that by the end of this two episode arc, I was fully on board. The moment when he learns of the Clone Wars and sighs "so it has already begun" was one of many ways that the show turned Maul from a simple instrument of death into a complex character with his own ambitions and dangerous obsessions. It was also a real treat to get to see Obi-Wan Kenobi and Asajj Ventress team up to fight Maul and Opress. For anyone like myself that avidly reads the Star Wars comics from this era, it's pretty well known that Obi-Wan is a tad fixated on trying to save Ventress from herself. Seeing these two finally work side-by-side was only made better by the fact that we got to see Maul get under Kenobi's skin as he taunts him about killing his master while he watched...and that the Sith brothers ended up being far too powerful for Ventress and Kenobi to defeat. In the end, Maul reveals that his ambitions have now expanded beyond simple revenge by way of executing Obi-Wan. His plans will end up being much bigger and will have serious repercussions for the rest of the galaxy. The graphic novel 'The Sith Hunters' reveals how Darth Maul escaped Naboo and ended up on Lotho Minor. After the suspected terrorist behind an attack on the Jedi temple is apprehended, she specifically requests to speak to Ahsoka Tano. During their meeting inside her prison cell, the suspect is force choked and killed by an unseen force, which makes it seem as though Tano was behind the assassination. After being wrongfully incarcerated, Ahsoka is assisted in breaking out of her Republic holding cell by an unknown benefactor. Her gratitude quickly turns to horror, however, when she sees that the person responsible for her escape has also killed numerous clone troopers with a lightsaber. 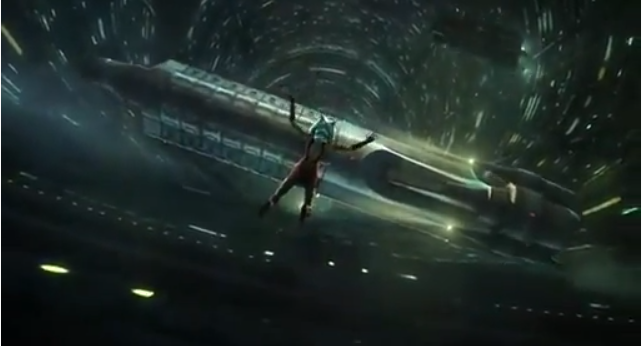 Even with her Jedi master Anakin begging her to turn herself in, Ahsoka makes a daring escape in her quest to avoid being recaptured while setting out to prove her innocence. Like a lot of Star Wars fans, I absolutely hated Ahsoka Tano when she was first introduced into the Star Wars universe. Not only did she present a wealth of continuity issues and illogical decisions (why the heck would Anakin be given a padawan? ), but her character also seemed like a ill-conceived attempt to connect with younger viewers through what at first seemed like a whiny and annoying brat. But as the show continued (and the dark cloud of the awful movie it originated from moved further into the past), Ahsoka's development and maturity ended up making her a truly great character that even the most jaded old school fan couldn't help but feel some affection for. In this episode, we get to see Ahsoka truly on her own without any guidance (or support) from the people around her. She ends up making some pretty gutsy decisions on her quest to prove that she was not to blame for a series of terrible crimes. We also get to see just how incredibly skilled she is while evading her former master along with a battalion of clones that pursue her relentlessly through Coruscant. Speaking of the clones, this episode provides yet another good example of why Order 66 was able to happen despite the trooper's loyalty to their Jedi commanders. When the command is given to hunt down the their commander, Ahsoka's former allies do not hesitate to follow orders; for all they knew, Ahsoka could have gone rogue just like Pong Krell had earlier on Umbara. But even if that was not the case, the orders came from up the chain of command and were not to be questioned. The clones had a job to do and were determined to carry it out with ruthless efficiency. The episode was also full of symbolism and homages to Star Wars lore. If the interior of the prison looked familiar, that's because it was very close in design to the holding cell seen on the Death Star in Episode IV. The towering clone statue against the backdrop of the the ship staging area seen in Episode III also gives us some foreshadowing of just how much the clone army was beginning to overtake the identity of the Republic from the Jedi and it's people. One of the best visual references, however, was made when Admiral Tarkin visits Ahsoka in her holding cell and grabs her chin in the same way he did with Princess Leia in Episode IV before annihilating her home planet. While this episode gets insanely high marks for how the action scenes were animated, there was also a lot of superb work done during subtle (and chilling) moments like these. The fantastic voice work by Ashley Eckstein (Tano) and Stephen Stanton (Tarkin) also greatly added to the drama, making the interaction between these two one of the most riveting confrontations of the series without a single lightsaber or blaster being drawn. 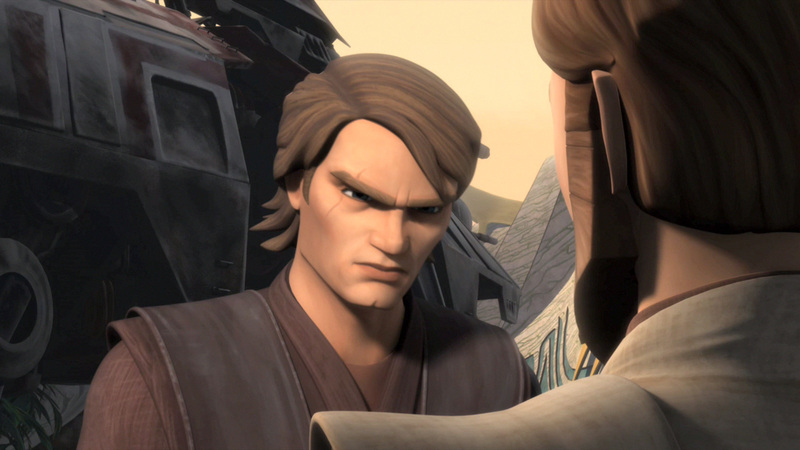 A close second, however, is Anakin's confrontation with Clone Commander Fox when he demands to be allowed to see Ahsoka and is sternly denied. It's yet another example of how focused on following orders the clone troopers really were along with some excellent foreshadowing of Anakin's dark side coming through. And while the name of the episode might be a riff on a classic Alfred Hitchcock tale, the best homage of all was paid to arguably the best "man on the run" movie ever made. Add in a fantastic musical score by Kevin Kiner and some of the best animation we've ever seen during the show's run, and you have (what's in my opinion, at least) the best episode of a great series. Each part of the four episode arc that included this episode is named after a different film by Alfred Hitchcock. One of my favorite early season episodes. Unfortunately, the fact that Nahdar Vebb was being set up for a death due to his hot-headedness was telegraphed so blatantly that it became distracting. Yes, that little orphan girl is impossibly adorable. But the episode never quite finds the right balance between "cute" and military action, leading it to feel a little bit disjointed. A solid entry, but once you've seen one "alien parasite takes control of the crew" plot, you've pretty much seen them all. Add in the fact that the potential for violence normally associated with this type of story is significantly neutered due to being on Cartoon Network, and this one just ends up being a really good (but not great) episode. This superb episode almost made the cut. But in the end, I felt like we didn't really get enough time with Pre Vizsla before he revealed himself as the leader of Death Watch. The fact that he also ran away from Kenobi during a fight like a pansy (and not at all like a true Mandalorian) didn't help, either. The battle between Anakin and Admiral Trench was definitely one for the history books. But if Trench delivered his lines with any more overwrought dramatic flair, he may have had to start calling himself Dr. Evil. As a monster movie lover, this was one of my personal favorites. It also serves a much needed reminder that Chancellor Palpatine is still a very evil person. This one also almost made the cut. Fantastic episode, but not quite Top 10-worthy. While I'm all for exploring the human side of the clone troopers, showing them being so dysfunctional that it leads to one attempting to go AWOL did not really ring true with what we've seen during the rest of the series. Banking clan conspiracies, false flag attacks, assassinations...this episode is like catnip for the Star Wars fan who is also a conspiracy theorist. But the lack of action (and the over abundance or bureaucratic back and forths) will at times try even the most dedicated fans' patience. Savage Opress ended up being a great character, but he works infinitely better when paired with his resurrected brother, Darth Maul. It's hard enough keeping the suspense on a show where we know that most of the main characters must survive. I know this will probably put me in the minority, but delving deeper in the psychological and spiritual aspects of Anakin's eventual turn to the Dark Side just seems like overkill by this point...especially over three episodes. All of these were great episodes (especially with the inclusion of Tarkin), but the action never really seemed to reach the fever pitch of 'Landing at Point Rain" or "Lawless". This was another one I went back and forth on a lot. While Cad Bane's concern for his fellow assassins (and competition) did feel a little forced, this was still a very good episode. As I mentioned on a previous Top 10 list, series finales are tricky. You have to wrap up a whole bunch of plot lines while giving fans that will tune in for the first time (or after a long absence) something entertaining to watch. While this episode gave long time fans of Star Wars: The Clone Wars a fitting and heart breaking end to Ahsoka's character arc, it's not really an episode that someone who wasn't very well versed in the Star Wars universe could sit down and enjoy like the ones that made the list. (It also didn't help that Barriss Offee being the mastermind was telegraphed from a mile away). But this one was still a great send off for a great era of Star Wars story telling. There's talk of the (incredible looking) finished material for Season 6 being released in the future on DVD/Blu-Ray. But the five seasons that make up this show's run already stand on their own not just as great Star Wars stories, but also as flat out great television. I'm sure that more than a few of you will disagree with my choices, but that's part of what makes being a fan of Star Wars so much fun; there are an infinite number of eras and pockets within the universe that someone will have a special affinity for. Let's hope that Disney continues the tradition of high quality production and riveting story-telling that Dave Filoni and his team started with this wonderful series. May the force be with them...and with you, as well. Screw up this franchise, Disney must not.